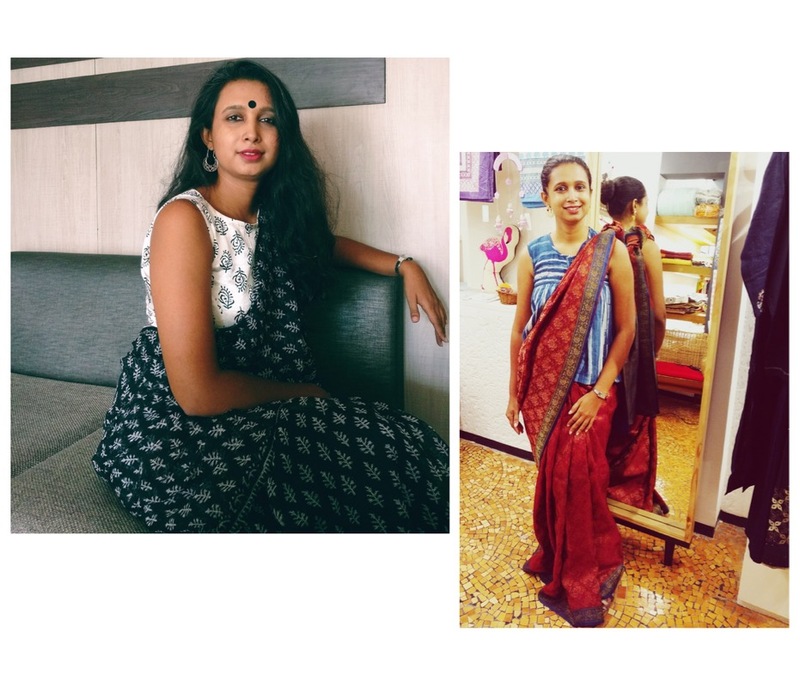 Mom, an avid saree wearer and a textile enthusiast, Rushika of ‘Life In A Saree‘ takes a keen interest in handwoven fabrics. Instead of reaching for sarees only on occasions, she’s been wearing them to work nearly all the time now. And luckily for her many followers on Instagram, she chronicles the sarees and the stories behind them, one image at a time. You can follow her on Instagram here. 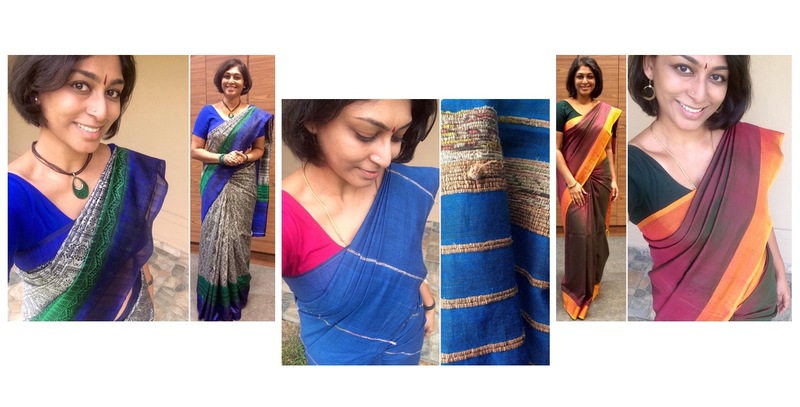 In this column, she shares with us her three picks for sari-wearing beginners. It is very difficult for me to pick just three from the vast variety of weaves out there! 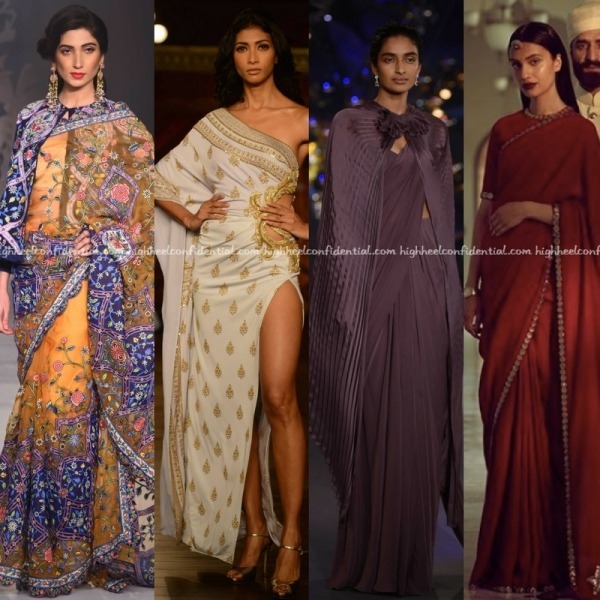 But if I am to play favorites, I’d say start with one saree that can last a 12 hour workday, one which can transition well from work to after hours, and one which is glamorous enough to be worn to occasions, the common thread between all three being comfort and easy of draping. Soft, gauzy Kota Doria sarees are a great place to begin with if one is looking to incorporate sarees as work wear. These may be all cotton or cotton silk, though it is best to steer clear of the stiffer and shinier synthetic, factory made mimic called Supernet. With the characteristic square chequered pattern akin to graph paper checks which is technically called Khat, wearing a Kota Doria is as good as wearing woven air! These are a popular base fabric for surface techniques like tie and dye (most leheriya), hand block printing or hand embroidery like Chikankari. The feel and the fall of an unstarched Kota Doria isn’t too different from wearing say, a chiffon, but minus the slipperiness of the latter, which makes them a fantastic starting point to foray into cotton sarees. For sarees that can go from day to night, work to play, look no further than Ikats! Ikat is a technique of resist dying of the yarns before they get woven which is practiced in places ranging from Uzbekistan to Indonesia and Japan to South America. India has a rich Ikat weaving tradition concentrated in Gujarat, Odisha, Andhra Pradesh, Telangana and parts of Tamilnadu. An Ikat saree may be all cotton, silk-cotton or all silk. From the intricate figurative patterns of Odisha Ikat, to the striking geometric and color block Ikats from Andhra/Telangana, to the exquisite Paatan Patola double Ikats from Gujarat – there’s something to suit all tastes and budgets. Nothing like a Benarasi silk for days when you need to dress to impress! Did you know that the term encompasses a variety of silks, right from bling fests like the Kataan silk Benarasis to the stunning Khaddi georgettes, to subtle raw silk Benarasis to intricate Tanchhoi silks without a speck of Zari?! Regardless of the variant, a Benarasi has been a part of the occasion wear lexicon of vast swathes of India since centuries and more often than not, you’re likely to find an old Benarasi lurking in your closet. These are such timeless classics that even a decades old Benarasi is unlikely to look dated if styled with a contemporary blouse. Start with these three and you are well on your way! Sumitra Selvaraj has been wearing sarees to work since she was in her twenties. And it frustrates her that weearing a saree regularly is considered somewhat odd. She believes it’s not the saree, rather the society’s perception of it that needs to be examined. And she’s been championing the cause and being part of the discussion, one saree at a time. When not writing Sarees and Stories, she can usually be found curled up and day-dreaming with a book, some single malt, her two dogs and husband all within easy reach. Find her Instagram here! If you’re planning on purchasing a saree for the first time, I’ll assume that it’s to wear to an event or a special occasion. Have you considered a Raw Silk saree? The name of the saree comes from the fact that the gummy coating on the silk filament is not removed prior to spinning, resulting in a silk yarn that is knobbly and uneven textured. This is then woven in a saree with a characteristically coarse feel, (compared to most silk sarees, which are spun from yarn made of ‘cleaned’ silk filaments) but the advantage of this is that the saree is easy to pleat and falls beautifully with little effort. Also, the uneven texture of the saree means that light reflects off of it differently, giving Raw Silk sarees a depth of colour like no other. When I started working, Chettinad Cotton sarees were my choice of office wear because the price point of these sarees was extremely wallet-friendly! Traditionally, Chettinad Cotton sarees are starched before draping, and this is what lends to its reputation of a ‘difficult’ saree. The secret of perfecting a Chettinad Cotton drape, lies in its starched countenance. Most Chettinad Cotton sarees come with a running blouse piece, which means that you need to remove a metre of fabric from the inside edge of the saree, to sew the blouse. My suggestion to you is to leave the running blouse material as is, and work with a saree that is almost 7 yards long. Make deep pleats to tuck into the waist; the deeper the pleat, the more likely it is to stay in place. If you’re looking for something that doesn’t require any special treatment, my suggestion would be a Khesh; these are soft cotton sarees that utilise recycled sarees as part of the weave. Old cotton sarees are ripped by hand into rags and are woven alongside new yarn, to form a saree that is the epitome of sustainable fashion. Khesh sarees are very plain… They are usually in a single colour and with a minimal number of narrow lines on the body and pallu. Besides the one of a kind appeal of a Khesh, the material itself feels like a well-worn t-shirt. The fabric is relatively thick (compared to a Chettinad Cotton) but instead of adding heft, the pleasing thickness of the Khesh means that the saree drapes beautifully, and doesn’t crease easily. 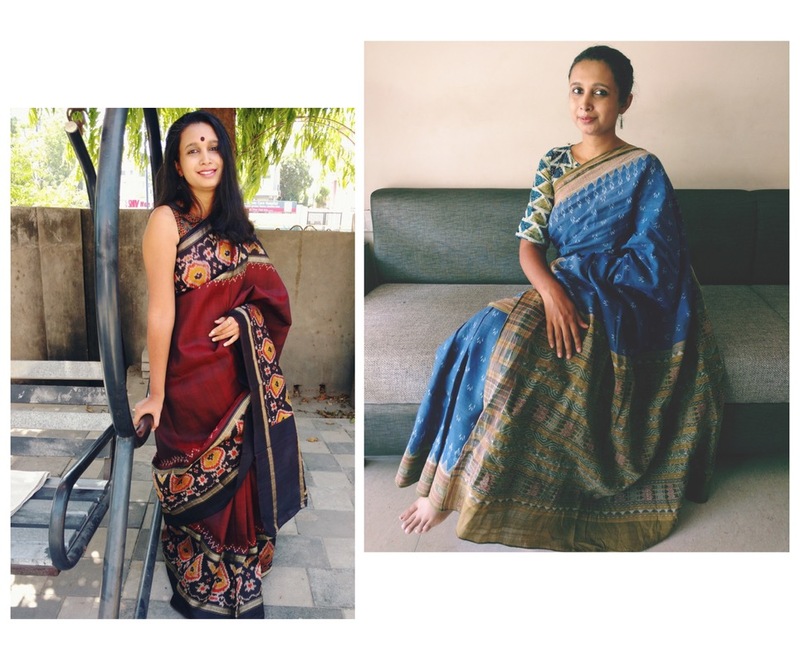 These three weaves are a great way to start you off on a saree discovering journey. When and why did you move to the US? Shradha: I left India in the end of August 2014 and moved in with my fiancé. We got married in December that year and the US has been home since. I’m relatively new, but what’s strange is some days it feels like I’ve been here forever and other days I feel I JUST moved! Priyanka: I moved in August of 2004, right after my wedding. (Yup, been married a while now!) Dallas is home now. As a kid, I moved around a lot when I was in India but funnily enough, Dallas has been the longest I have lived in anyplace. That strange feeling you were talking about, that doesn’t seem to have gone away for me even after all this time. Some days I feel like this isn’t home, it’s temporary, that I just moved and will move again. And some days I can’t imagine being anywhere else. Payal: I came to the US for my undergrad way back in 1998. I stayed in Michigan for four years, got tired of the extreme winters and moved to Texas when I got my first job. Have been in the Lone Star State ever since! Can’t believe it will be 20 years in the US next year! What’s the toughest part of being away? Shradha: I hate being so far from friends and family. And eating home cooked meals NOT cooked by me is a pain point too. Priyanka: Can I just say Ditto? Friends and family are a big part of it. Considering my sister moved back to India and sees my parents more often than I do, I can’t shake off that FOMO. And friends too! I have been incredibly lucky in finding awesome friends this side of the pond. That said, there’s something about pre-adulthood friendships that makes them invaluable. Oh and I have major bai/dhobi/cook envy. Payal: I grew up in the Middle East so I’ve been away from India since I was 12. I also lived in a hostel for a while. Being away from home was something I was used to. When I moved to the US, I guess I missed food the most. Indian food wasn’t so readily available back then let alone good Indian food. But, it’s different now. Dallas has us spoilt for choices. Now, if only I could find a restaurant catered towards Oriya/Bengali style of cooking, and I would be a happy girl! The only thing I miss now are the festivals. Like the mood around Eid in the Middle East. And Diwali and Dussehra while I was in India. How long did you take to adjust to life away from your roots and how did you build your new support system? Shradha: I think I’m still adjusting. The first year in New Jersey was rough. I tried the whole house wife thing but it wasn’t as glam and I wasn’t really lunching that much with any ladies! 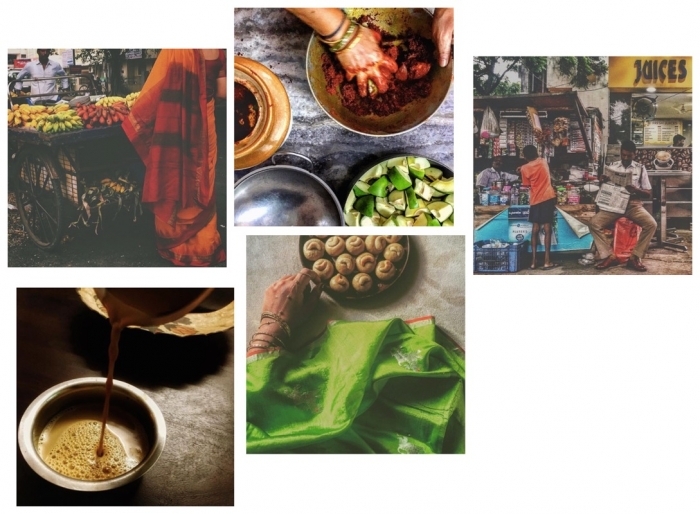 My husband had a group of friends who gave me the 411 on life in the US — everything from how to boil dal to what masalas to stock in the kitchen! Some of those friendships clicked and have grown to be real, solid relationships. Two years ago, we moved to San Francisco and I had to start the process of building friendships all over again. I’ve met people through my day job and through the usual friends-of-friends route. It’s probably going to take a long, long time to consolidate my core group but I’m grateful to have found some amazing new friends. So yes, the new support system is underway! Priyanka: I was lucky enough to walk in to a social situation I could easily adapt to. The women I met nearly a decade and a half ago are today some of my closest friends. I also reconnected with some of my friends who had moved away and had somewhat drifted apart. Getting to know them again was fantastic! I also quickly realized that when you meet someone you hit it off with, make it a point to stay in touch with them or at least see if there’s a friendship to be had there. Making friends as adults is hard and it will serve us all well to remember the other person is no different from us, and it’s just as hard for them. It wasn’t all easy but I let things take their time and it all eventually fell in to place. Big shoutout to a very supportive husband who let me rave, rant and whine when I wanted to and helped me snap out of my funk when I most certainly needed to. Payal: College wasn’t so hard as I had a class-mate from high-school also attending the same college as mine. That made the first semester a whole lot easier. When I first moved to Dallas after graduation, I decided to get a roommate. Best decision ever! Our social circle pretty much grew from us two meeting new people (including Priyanka) from the day we roomed together and this was almost 15 years ago. Till date, she and I still hang out if not every weekend, every two or so. I don’t even think I can ever think about moving out of Dallas because of the strong social circle here. My inner friend circle is family. We’ve gone through ups and downs together. Star Speak is an ongoing series of columns, penned by celebrities/designers we are used to seeing on these pages. This is their space to write about their take on fashion, the fraternity and whatever else catches their fancy. This week’s column comes from designer duo Rimple & Harpreet Narula, costume designers of an upcoming film, ‘Padmavati’. You have seen their designs on many A-list celebrities on these pages and now, read about them working with an A-list director. P.S: Follow Rimple & Harpreet Narula on Instagram here and look them up here. P.P.S. 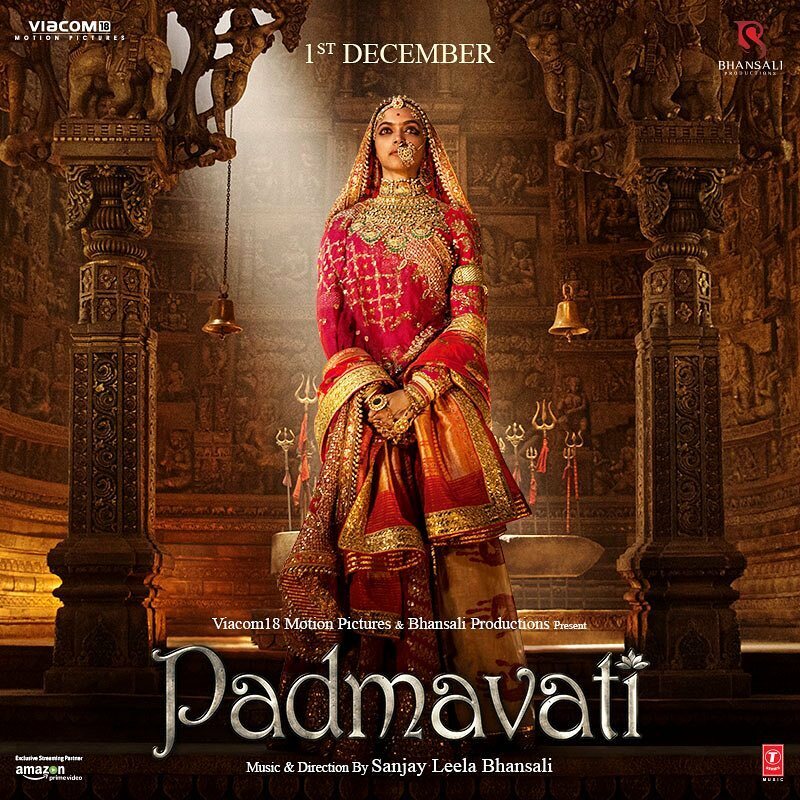 Post was updated to show images of Padmavati’s first look pictures. Our foray into the Bollywood realm is nothing short of a dream… Working on a Sanjay Leela Bhansali movie, designing the costumes for the period-drama and dressing the most gorgeous lot – Deepika, Shahid and Ranveer. Designing, for us, is incarnated from our travelogues, from rare experiences evoking new emotions, from narratives of vintage textiles and from reminisces held by flea market souvenirs. Every province and every period has unique mixes that inspire us. Padmavati is one such project which offered a stunning mix of contrasting cultures layered with the intense characters portrayed by the lead cast. Padmavati allowed us to embark on a new aesthetic journey and explore the world of period costume from a different tangent. Our ideas amalgamated with Sanjay Leela Bhansali’s vision shaped the very essence of the characters’ costumes. Mr Bhansali’s cinema is much understated and yet visually larger than life. He captures the nuances of the characters through different mediums, costumes being one of them. While maintaining the authenticity of the period we had to ensure that we functioned on the same wavelength. The costumes resonate with the personalities of each character; Padmavati’s timeless beauty and valor, Khilji’s passion and Ratan Sen’s warrior spirit. The most intriguing bit was the mystique around Padmavati’s legendary beauty which we tried to amplify through the elaborate costumes. A great deal of attention was paid to miniscule details in terms of colors, textures and silhouettes, to ensure an impactful visual statement. Celebrating its 10th edition this year, the event was everything that you would expect. Larger than life sets; sequins and shimmer; swanky venue; weighty FROW; Bollywood show stoppers; Rohit Bal’s signature floor grazers, each more voluminous than the previous and a glittery Manish Malhotra finale starring Alia Bhatt and Ranveer Singh. Seven days, 14 designers and at least 500 looks. 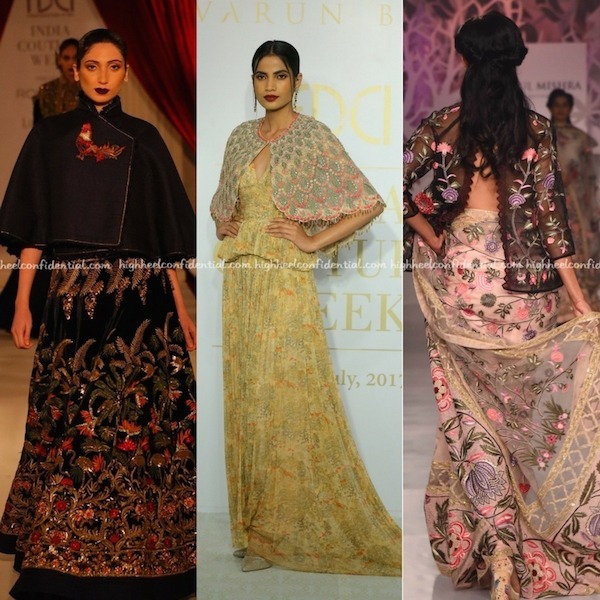 Read on to find out why Manav Gangwani and Rina Dhaka stole the show. Just kidding! Here are some highlights of the week that was. I was not kidding about the bridal trends and if there is one trend that is clearer now than ever, it’s that the lehnga-choli can be well on its way to an extinct combination. Worn with lehngas and saris, these new age capes, cold-shoulder blouses and trapeze tops are so forgiving. Breathe (or eat) easy, would-be brides! 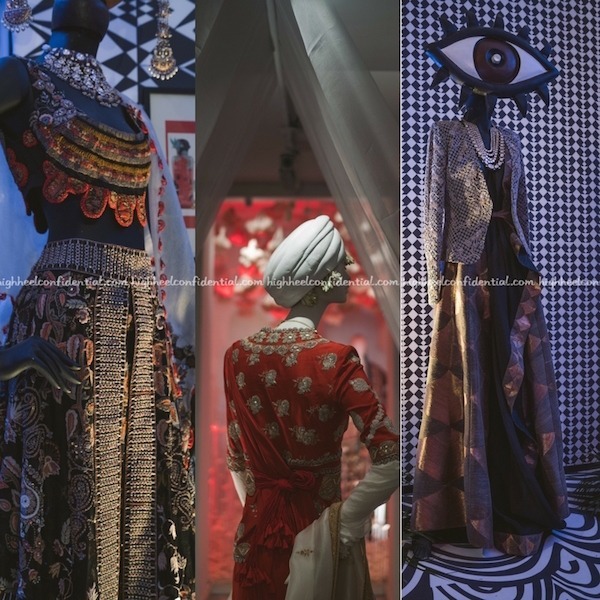 Anamika Khanna opened this year’s event with an installation titled Happily Ever After at The Kila in Seven Style Mile. Segmented into Welcome Lunch, Mehndi, Cocktails and Wedding, the collection amalgamated traditional Indian techniques with a modern Indian vibe, with twist and turns that Anamika is known to pull off. Pretty pastels to fiery reds, intricate embroidery and heirloom Benarasi textile interplayed with her spectacular silhouettes… I can go on and on. In short, everything made it to my lust list. 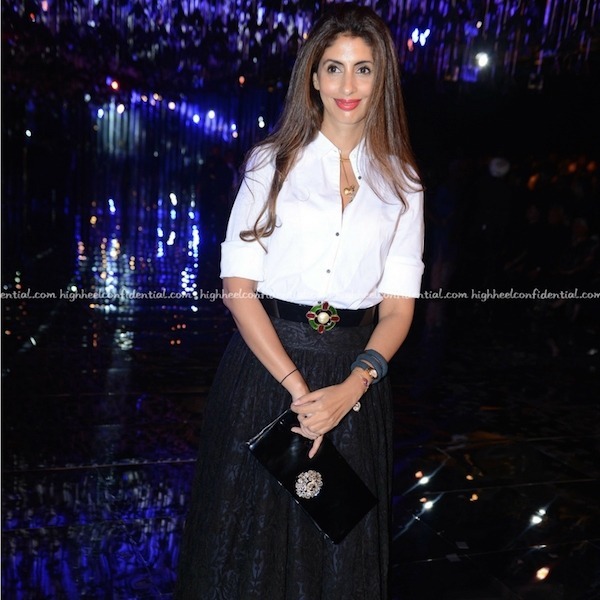 Okay, can we take another moment and talk about Shweta Bachchan in that white shirt? Paired with a Manish Malhotra skirt and accessorized with a gripoix buckled Chanel belt, she worked that look. I know some of you liked it and some didn’t, personally I thought that white shirt made for quite a fashion moment and I will be taking mine out soon!